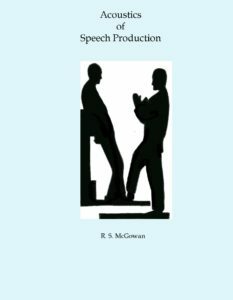 CReSS Books is now open for business with its first book: Acoustics of Speech Production by R. S. McGowan. We are running a sale in April with free shipping within the U.S. and $10 off international shipping. Also, we are offering 5 books shipped to a single U.S. address for $200. Please go to Special Shipping of Print Copy for these offers. Acoustics of Speech production provides an understandable description of the fundamental acoustics of the vocal tract. There are many simulations with graphical presentations of acoustic wave motion and other phenomena. The book also relates this physical description to previous descriptions that use electrical analogs. Acoustics is developed as a part of the broader study of fluid mechanics, so that we are able to to relate acoustic sources, such as the voice source to the propagation of acoustic waves in the vocal tract. The book also contains two new research results regarding the development of speech in young children and on the physics of vocal fold vibration. Dr. McGowan’s excellent book is aimed at readers with little or no knowledge of calculus — ideal for beginners, but also valuable reading for professionals. It is neither a traditional text nor a reference, but a narrative description of a journey through increasingly sophisticated models of the vocal tract. The physics and the mathematical foundations of vocal tract acoustics are expounded progressively and simultaneously with the help of an elementary finite difference approximation. The journey starts with one-dimensional acoustics in a uniform tube, developed with the aid of a simple mass-spring analogy, and continues through discussions of tubes of variable geometry, with side branches and small attached resonators. Damping of sound by mechanisms within the tract and by radiation from the mouth are discussed. These models are typically represented in terms of quite complex formulae, most of which can be derived using the author’s finite difference method, and are illustrated extensively by graphical output from numerical simulations. The book ends with more speculative treatments of the nonlinear mechanics of air and wall motions in sections of the vocal tract where the acoustic model breaks down, including an account of the aeroacoustics of the glottis. Highly recommended! This is the most comprehensive book on speech acoustics, the science of how sound is created and transmitted through one of the most peculiar products of evolution, the vocal tract. The author gently guides the reader through the breadth of different acoustic configurations, treating each with care, and always starting from basic principles. In earlier chapters, the author uses discretization to explain the most important concepts for students who have yet to master the calculus. The rest of the book can be understood as the reader simultaneously learns the requisite mathematics. This book will be essential not only for phoneticians and phonologists, but also for all those applying machine learning methods to speech recognition, as this book points to the origin of the correlations in the speech signal learnt by their methods. In this important book Richard McGowan provides a rigorous, but accessible, exploration of the physics underlying the acoustics of speech production. If you want to enhance your understanding of critical topics from mass-spring systems to fluid dynamics and aeroacoustics, then I encourage you to get a copy of it as soon as possible and start digging in. McGowan is masterful in his ability to guide you along the way, providing a wealth of explanation, supporting illustrations, and mathematical foundations. Within the United States you can purchase a traditional print book that will be shipped to you by Harvard Book Store. Just use the hotlink below to be directed to the book on the Harvard Book Store website priced at $47.50 plus shipping. For those in the United States who would like a copy signed by the author, the shipping is $7.00. Sales tax is applied for Massachusetts shipping addresses as well. For the spring sale with free shipping within the United States, use the “April Sale” button below. Both outside the United States and within the United States you can purchase an electronic version of the book as a PDF file. Quantity discounts are available here as well. The link to the ebook will appear on your email purchase receipt.